Before we digging in how to create macros, we need to understand the types of VBA macros. Before getting into the details of creating macros, you need to understand a key distinction. A VBA macro is also known as a procedure. Macro can be of two types: a Sub or a Function. We’re going to discuss the differences between VBA Sub procedures and VBA functions. Subprocedure can be treated as a new command like other commands in Excel. Any user of your workbook can use this command. A Sub procedure can also be executed by other Macro. 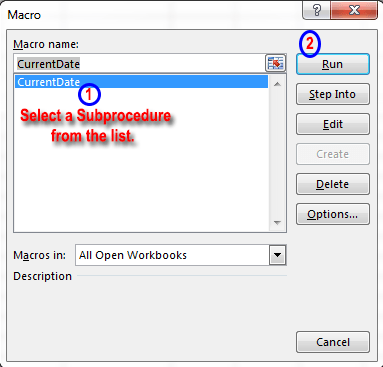 You can have any number of Sub procedures in an Excel workbook. The following figure shows a simple VBA Sub procedure. 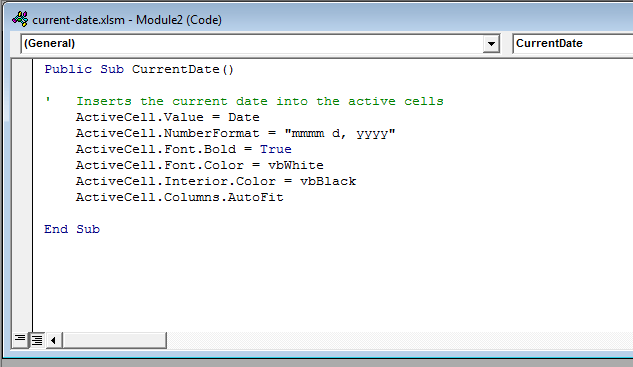 When this code is executed, VBA will insert the current date into the active cell, apply a number format like “mmmm d, yyyy”, make the cell bold, set the text color to white, set the background color to black, and adjust the column width. 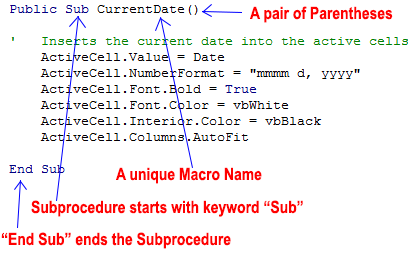 Subprocedures always start with the keyword “Sub”, the macro’s name, and then a pair of parentheses. Every macro must have a unique name. The parentheses are required. They’re empty if the procedure doesn’t use any arguments. The “End Sub” statement signals the end of the procedure. The lines in between comprise the procedure’s code. The CurrentDate macro also has a comment. Comments are simply notes for users, and they’re ignored by VBA. A comment line begins with an apostrophe. You can also put a comment in the same line as a statement. In other words, when VBA encounters an apostrophe, it ignores the rest of the text in the line. Macro dialog box. Select a Sub procedure from the list. Press the procedure’s shortcut key combination (if it has one). Click a button or other shape that has a macro assigned to it. If the VB Editor is active, move the cursor anywhere within the code and press F5. Execute the procedure by calling it from another VBA procedure. This VBA function returns the cube root of its argument. The figure, besides, shows a custom worksheet function. This function is named CubeRoot, and it needs a single argument to perform its job. 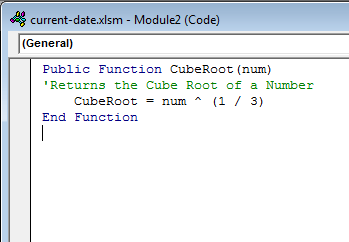 CubeRoot VBA function calculates the cube root of its argument passed to it and returns the result. A VBA function procedure looks much like a Sub procedure discussed above. Notice that function procedures start with the keyword Function and end with an End Function statement.